Home > TECHNIC SUPPORT > How Does A Well Drilling Rig Work? A well drilling rig is a large piece of equipment, it has crawler type, wheel type, truck type, etc. 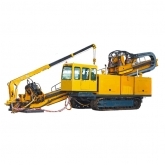 For the crawler and wheel type that must be brought to a site by truck on the site where the well is to be dug. Drilling rigs are either rotary drillers, which bore down into the earth using a circular motion or a “pounder,” which raises and lower a heavy weight in a technique known as "cable drilling" to punch holes. A rotary drill rig uses an assortment of bits. The most common types are long cable bits or interlocking steel bits – both which rotate in a clockwise direction to bore into the earth and loosen the soil. Rock is carried to the surface as the bit turns. The turning bit often gets hot, so water or mud is used to keep the drilling bits cool. That’s why mud pump will be matched with well drilling rig together in use. On the site, people also need to dig two water pool for recycling usage when drilling. The goal of well drilling is to reach an aquifer or water source deep below the ground, but that’s not where the drilling stops. To ensure the well will have ample supply and a long life, the well drilling company will continue to drill below the water table. Bedrock wells are usually between 100 and 500 feet but in some cases can be more than 500-feet-deep. The well drilling rig has different function and capability, to ensure the high cost-performance ratio, we suggest to buy the suitable rig as per water level.